Sticker Shock: $51,000 A Year For Affordable Health Care??!! [Madison, Wis…] What will be the fate of Obamacare and its infamous premium increases? The results of Tuesday’s election make that a valid question – President-Elect Donald Trump has vowed repeatedly to eliminate the health care law, the signature achievement of President Obama’s tenure. Along with Republican majorities in the House and Senate, repeal is possible. News of double digit premium increases for Obamacare enrollees likely propelled Trump and other Republicans to unexpected victories Tuesday night. The MacIver Institute examined those increasing costs in Wisconsin for 2017. 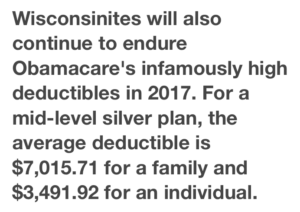 For example, a Wisconsin couple unfortunate enough to be in their 50s with three children could pay almost $51,000 per year in Obamacare health insurance premiums in 2017, according to figures now available through the federal healthcare.gov website. The shocking $51,000 a year plan is a gold-tier plan available through Anthem Blue Cross Blue Shield in La Crosse, Jackson, Monroe, and Trempealeau Counties. It’s a startling reminder of what life under Obamacare premiums in 2017 will bring barring ambitious action by the new president and Congress. It’s Obamacare open enrollment season, and the MacIver Institute analyzed 2017 plan data available on the federal Obamacare website. 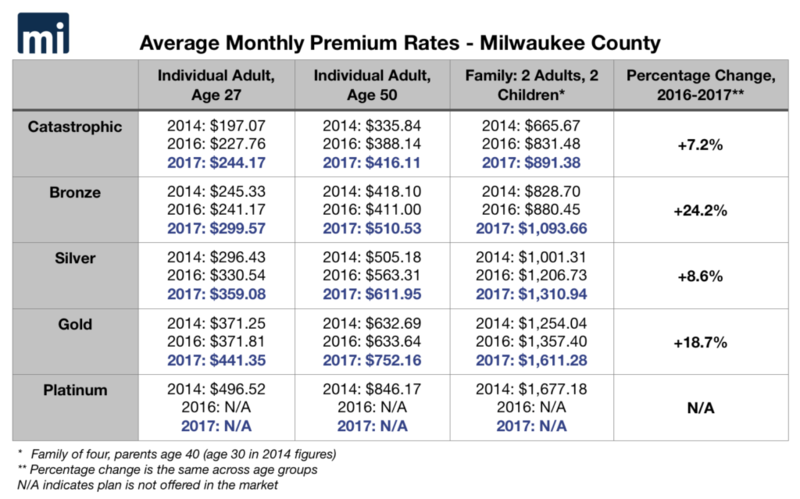 We found the $51,000 plan to be among the most expensive health insurance options being offered in Wisconsin next year, but it’s hardly the only example of the dramatic premium increases that Obamacare customers in Wisconsin are now seeing. Prices and rate increases varied widely across the state. One of the cheapest plans was a bare-bones catastrophic plan for a 27-year-old individual offered in Adams County by Dean Health Plan, which will cost $129.56 per month. Overall, Obamacare customers in Wisconsin can expect to see a 16 percent month premium increase in 2017, according to the state Office of the Commissioner of Insurance (OCI). In this report, we summarize our findings about 2017 Obamacare premiums around the state. Wisconsinites shopping for health insurance on the federal health insurance market can expect to see double digit average rate hikes for insurance on the Obamacare exchange in the open enrollment period that started Nov. 1. Overall, Wisconsin Obamacare premiums will increase by 15.88 percent in 2017, according to the state OCI. The OCI reviewed and approved the rate changes requested by Wisconsin insurance companies earlier in October. The Obamacare exchange breaks down plans into five plan categories: catastrophic, bronze, silver, gold, and platinum. Catastrophic plans have the lowest monthly premiums and highest out-of-pocket costs, while platinum plans have the highest monthly premiums and lowest out-of-pocket costs. Using data from the healthcare.gov website, the MacIver Institute calculated the averages for each of the five plan categories for three different age groups: individuals aged 27, individuals aged 50, and a two-parent, two-child family with parents aged 40. An individual can stay on their parents’ insurance until the age of 26. The complete federal database of plan information is available here. A 27-year-old individual in Wisconsin can find catastrophic health insurance on the Obamacare exchange with a monthly premium averaging $229.66, while the highest-cost platinum plan has an average monthly premium of $440.76, or $5,289.12 per year for the same age group. 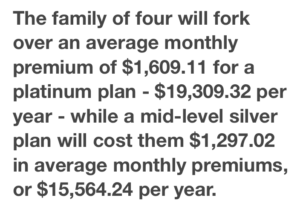 A mid-level silver health care plan for the 27-year-old has an average monthly premium of $355.27. A 50-year-old individual faces considerably higher costs. The lowest-cost catastrophic plan for that age group has an average premium of $391.39, while the highest-cost average premium is $751.14 per month for a platinum plan. A silver plan, which falls in the middle, has an average monthly premium of $605.45, or a stunning $7,265.40 per year. Families will again face the highest premiums on the Obamacare exchange. The lowest average premium available for a family of four – two 40-year-old adults and two dependent children – is $558.39 for a catastrophic plan, or $6,700 per year. 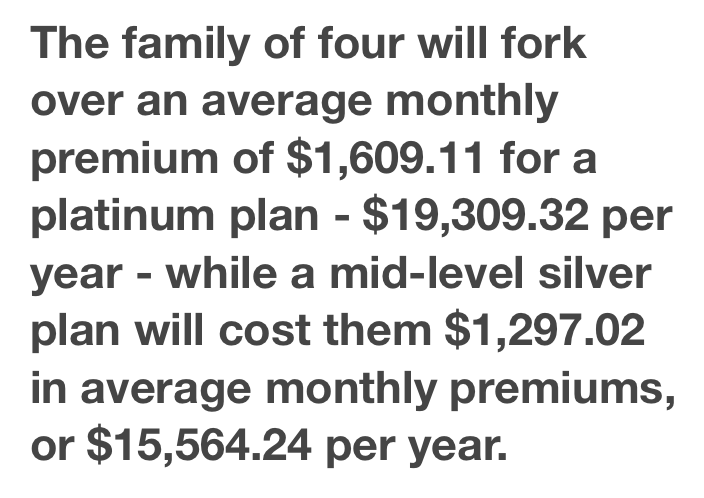 The family of four will fork over an average monthly premium of $1,609.11 for a platinum plan – $19,309.32 per year – while a mid-level silver plan will cost them $1,297.02 in average monthly premiums, or $15,564.24 per year. 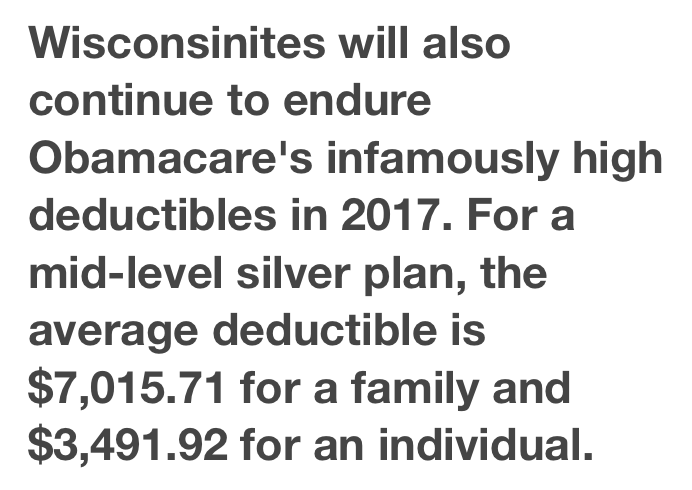 Wisconsinites will also continue to endure Obamacare’s infamously high deductibles in 2017. For a top-tier platinum plan the average deductible is $900 for a family and $450 for an individual. However, for a mid-level silver plan, the average deductible is $7,015.71 for a family and $3,491.92 for an individual. The average catastrophic plan deductible will be $14,300 for a family and $7,150 for an individual. Catastrophic plans are typically high-deductible plans intended to cover medical emergencies with a minimal monthly cost, but with monthly premiums ranging from nearly $230 per month for a 27-year-old to nearly $560 per month for a family of four, even catastrophic health insurance coverage will be out of reach for many Wisconsinites. The MacIver Institute examined 11 counties throughout the state, representing both urban and rural areas including Douglas County in far northwest Wisconsin, Milwaukee County, Grant County in the state’s far southwest to Vilas County along the Michigan border, along with population centers in between. While premiums will increase 16 percent overall, rate changes vary widely throughout the state. In Brown County, the catastrophic plan will increase 30.3 percent for all age groups to $899.59 per month for a family of four, or $246.41 for a 27-year-old individual. The gold plan in Brown County will jump by 31.7 percent to $1,675.49 for a family of four, or $458.94 for the 27-year-old. Douglas County’s bronze plan – the most common Obamacare plan – will increase 30.9 percent to $1,209.06 per month for the family of four and $331.18 for the young individual. Increases in the bronze plan were common among the 11 counties we examined this year. Eau Claire County’s bronze plan will jump by 23 percent to $1,178.58 per month for the family of four and $322.83 for the 27-year-old. La Crosse County’s bronze plan will increase 23.2 percent to $1,377.28 for a family of four and $377.26 for the 27-year-old. Milwaukee County’s bronze plan spikes 24.2 percent, costing a family of four $1,093.66 per month and a 27-year-old $299.57 per month. In addition, Grant County’s bronze plan will increase 22.4 percent, Winnebago County’s will go up 19.7 percent, Rock County’s will go up by 16.4 percent, and Vilas County’s will spike by 14.2 percent. Some Wisconsinites will dodge the massive rate increases. 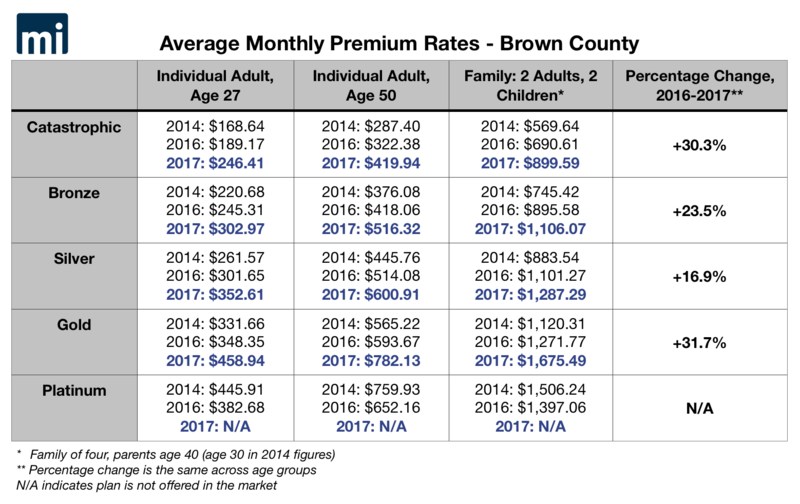 In Forest County, on the Michigan border, average monthly premiums will increase modestly for a 27-year-old, from $291.35 in 2016 to $296.10 in 2017. For a 50-year-old individual monthly premiums will go from $496.52 to $502.92. For a family of four, rates will increase from $1,063.65 to $1,077.36 per month. Rates will drop modestly in Florence County, also on the Michigan border. For a 27-year-old, the monthly premium will go from $285.38 to $282.13. For a 50-year-old rates will drop from $486.34 to $480.31. For a family of four, the price will decline from $1,041.84 to $1,030 per month. The average statewide deductible for the benchmark bronze plan in 2017 is $12,414.46 for a family and $6,207.23 for an individual. Other large premium increases include Grant County’s platinum plan, which will increase by a whopping 36.7 percent, costing a family of four $2,040.44 per month – nearly $25,000 per year. La Crosse County’s catastrophic plan will also jump 26.9 percent, costing the family of four $1,187.86 per month and a 27-year-old $325.37 per month. See our examination of the premium rate changes in 11 Wisconsin counties here. Insurance companies got final clearance in October from the OCI to change the rates they charge for monthly premiums. On average, insurers are increasing rates by nearly 16 percent, and each insurer’s rate change varies widely depending on which region of the state the plan is offered in. One major insurer, Aetna, will increase its premiums by an overall 29.32 percent for its small group PPO plan, with increases varying from 7.59 percent to a maximum of 59.71 percent. The company states the change will affect just over 9,000 people, according to OCI documents. Dean Health Plan, Inc. will raise premiums for its individual HMO plan by an overall 18.73 percent, with rate changes varying from a 9.73 percent reduction to a 46.34 percent increase. The company states that rate hike will affect nearly 29,000 Obamacare enrollees, OCI documents state. The company also plans a 2.91 percent decrease for its small group plan. Gundersen Health Plan, Inc. will increase its premiums by an overall 9.33 percent for its small group plan, affecting just over 5,000 people, and 18.36 percent for its individual plan, affecting almost 4,000 people. That plan’s premium increases vary wildly from 7.87 percent to 42.67 percent. Blue Cross Blue Shield filed a 3.96 percent decrease for its small group plan, but that plan is listed as “off-exchange” and only affects 270 people. WPS will increase premiums for its small group PPO plan by 9.78 percent overall, with prices ranging from a 4.3 percent reduction to a 55.66 percent increase. WPS will also increase premiums for its individual PPO plan by 5.39 percent overall, with changes ranging from a 14.8 percent reduction to a 20.94 percent increase. The Arise Health Plan, a subsidiary of WPS, plans premium increases of 6.29 percent for its individual HMO plan and 3.14 percent for its small group HMO. Common Ground, Wisconsin’s health care co-op established under Obamacare, plans an increase of 27.69 percent for its individual plan – from a minimum of 8.95 percent to a maximum of 41.8 percent – rate changes that will affect 19,300 people. Last year, Obamacare-compliant plans saw premium increases between 11 and 19 percent, as the MacIver Institute reported in December. In addition, our analysis found 600 fewer plans to choose from in 2016 compared with 2015. The drastic increase in prices was widely expected after several major insurers dropped out of Obamacare markets around the country over the course of the year. Those insurers, such as UnitedHealth and Humana, cited massive losses as a result of more expensive enrollees, fewer younger and healthier enrollees, and more people deciding to pay the penalty rather than buying increasingly expensive insurance plans. While far from ideal, Wisconsin’s 16 percent increase is well short of the estimated 25 percent average national increase and far lower than Minnesota’s 50-67 percent increases announced last month. The price increases experienced in Wisconsin and nationwide are the result of an older and less healthy group of enrollees, factors that have caused several of the nation’s largest insurers to stop offering plans on Obamacare exchanges altogether, including Wisconsin. UnitedHealth and Humana, two of the largest health insurance companies in the country, both backed out of Wisconsin’s Obamacare exchange entirely earlier this year, citing massive losses. Anthem also significantly cut back its offerings in 34 counties last year and withdrew from Milwaukee, Kenosha, and Racine counties entirely. With fewer companies competing in the Wisconsin exchange and the unbalanced risk pool driving up costs, premium increases have continued to far outpace inflation. According to data from the OCI, Wisconsin’s Obamacare market lost an average of 1.39 insurers per county from 2016-2017 despite claims by proponents that the health care law would increase competition. Fourteen counties will have just one or two insurance companies offering plans on the Obamacare exchange in 2017. Between 2016 and 2017, 13 counties lost three insurers, while Outagamie County lost four insurers offering plans on the Obamacare exchange. A comprehensive listing of the number of Obamacare insurers by county can be found here, and the OCI offers interactive maps of insurers by county here. Though the majority of Wisconsinites still have a choice between two or more insurance companies, the decline in competitive markets has played out nationally on an even more dramatic scale. According to reporting by McClatchy, 21 percent of customers shopping in Obamacare exchanges will find only one insurance company in 2017, compared with just 2 percent in 2016. Even Minnesota’s Democratic governor recently acknowledged Obamacare’s failure to offer affordable insurance in the wake of the near-collapse of his state’s Obamacare market. “The reality is the Affordable Care Act is no longer affordable for increasing numbers of people,” Gov. 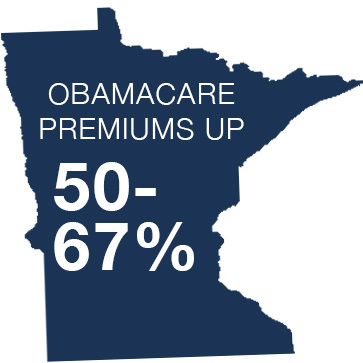 Mark Dayton told the Associated Press earlier this month after state officials announced Obamacare premium increases of 50-67 percent for Minnesota in 2017. While Obamacare’s proponents point out that federal subsidies reduce the impact of such sky-high premium increases on the poor, they forget the middle class enrollees for whom the subsidies won’t apply. For example, in Minnesota, 123,000 Obamacare enrollees will be subject to the full price increases. Ultimately, such arguments also ignore the fact that the subsidies are funded by taxpayers, so massive premium hikes end up costing all Americans much more than they bargained for. Obamacare was meant to bend the cost curve down – not bend it up and then back down through even larger government programs. Obamacare’s open enrollment period ends on Jan. 31, 2017. The MacIver Institute will continue to bring you new information about the federal healthcare law’s many consequences for Wisconsinites and Americans in the coming months.